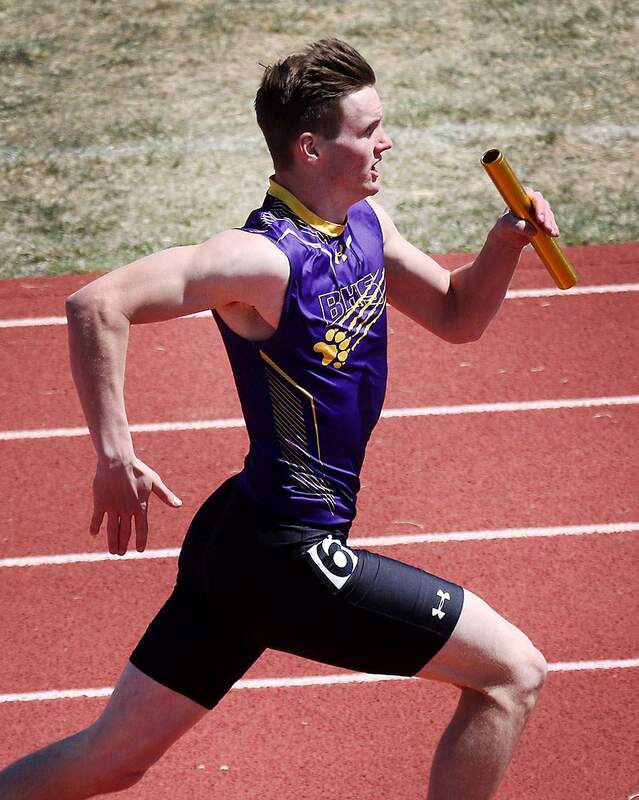 Carl Heide of Bayfield High School runs the anchor leg of the 4x200 relay during the Pine River Invitational track meet Saturday at Bayfield High School. The Wolverines won the event and the boys team title. 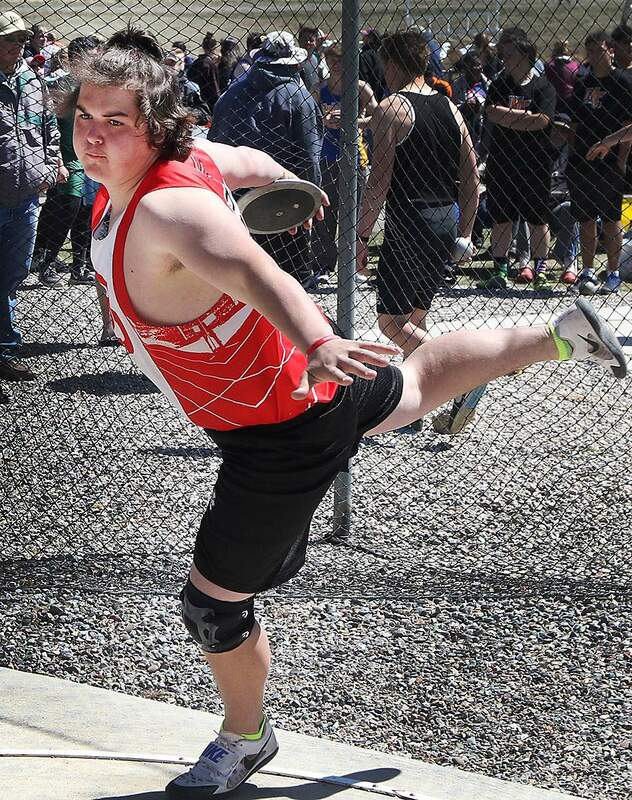 Brian Elvidge of Durango High School throws the discuss during the Pine River Invitational track meet Saturday at Bayfield High School. 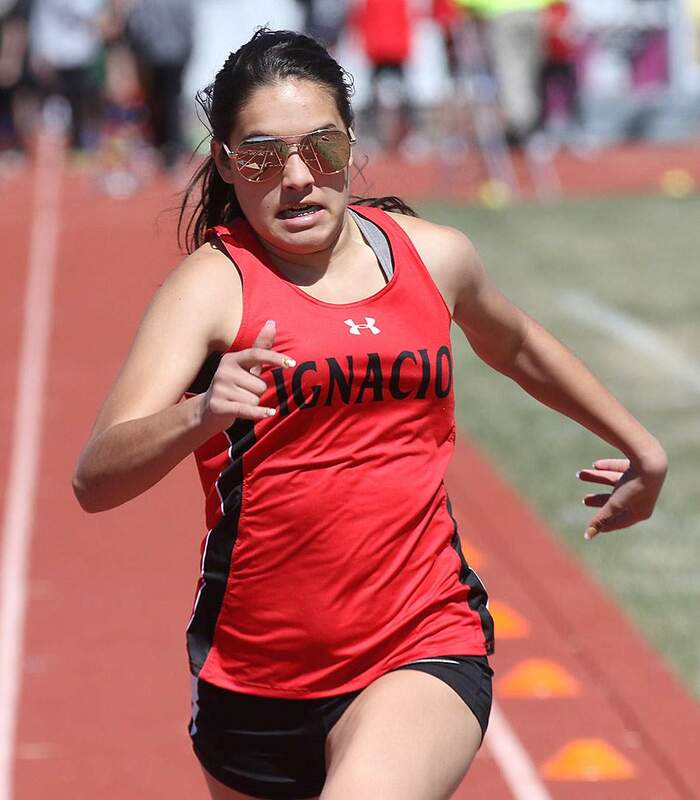 Kiana Valdez of Ignacio High School competes in the 100 meters during the Pine River Invitational track meet Saturday at Bayfield High School. Mylee Sanders of Bayfield High School competes in the 100 meters during the Pine River Invitational track meet Saturday at Bayfield High School. 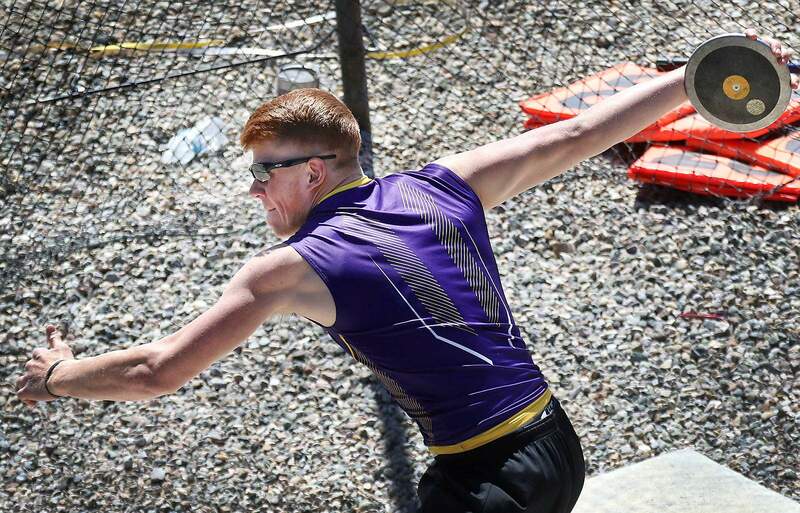 BAYFIELD – The Bayfield boys and Alamosa girls established themselves as the top teams early on at the Pine River Invitational track and field meet Saturday at Wolverine Country Stadium in Bayfield. 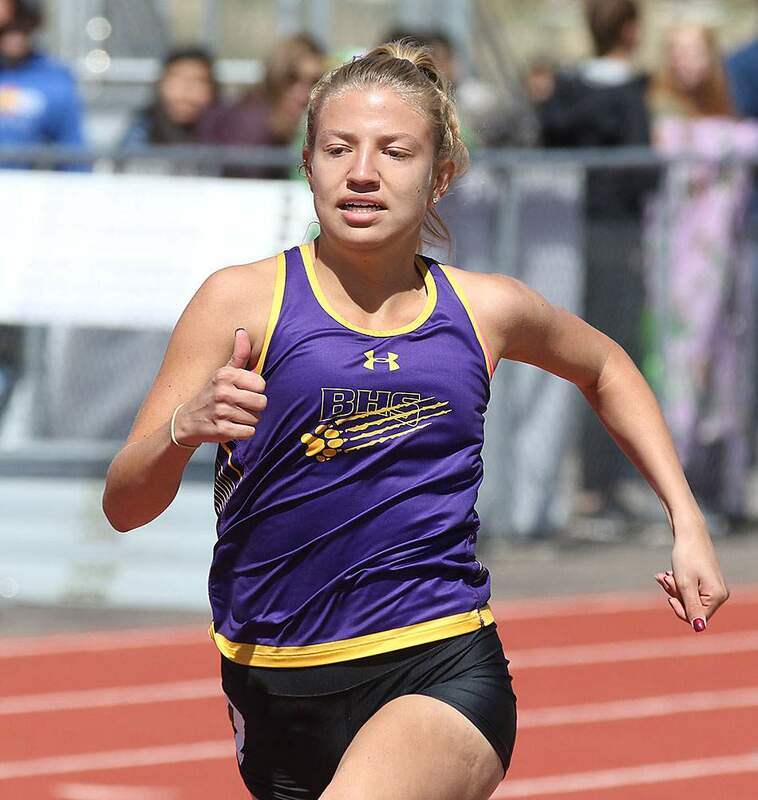 The Bayfield boys pulled away from the field midway through the day, while the Alamosa girls were untouchable on their way to team titles at the meet, which also served as the Class 3A Intermountain League championships. The Wolverines finished with 159.5 points to win the boys event and the 3A Intermountain League title. Alamosa was second with 123.25, and Class 4A Durango placed third with 114 points. Montezuma-Cortez placed fourth with 66 points, just ahead of Mancos with 64.75 points. Ignacio placed ninth with 17 points, Dolores was 11th with eight points and Dove Creek was 12th 5.5 points. The Alamosa girls piled up 188 points to finish 100 points ahead of Durango’s second-place score of 88 points and Bayfield’s 82 points for third place. Cortez was fifth with 75 points, Dolores placed seventh with 29.5 points, followed by Dove Creek in eighth with 28 points. Igancio placed 11th with 13 points and Mancos was 12th with six points. The BHS boys 4x200-meter relay team of Carl and Dawson Heide, Dylan Hilliker and Wyatt Killinen won and set a new school record of 1:32.04. The BHS boys team of Carl and Dawson Heide, Killinen and Dax Snooks placed second in the 4x400 relay with a time of 3:30.79, which is the third-fastest time in the state this year. Alamosa won the 4x400 in 3:29.35, which is the quickest time in the state. Carl Heide dominated the hurdles with wins in the 110- and 300-meter hurdles. He won the 300 event by better than four seconds with a time of 40.40 seconds, and he beat Snooks in the 110 hurdles by 0.48 seconds. Snooks won the high jump for Bayfield with a mark of 6-feet, 1-inch. The BHS boys swept the pole vault, with Colton Fine taking the title after clearing 12-06. Dawson French was second at 11-06 and Chad Winkler was third at 11 feet. Ryan Phelps of Bayfield High School throws the discuss during the Pine River Invitational track meet Saturday at Bayfield High School. Phelps won the event with a throw of 155-09. Ryan Phelps and Killinen took first and second in the shot put. Phelps won with a throw of 49-09.75. Killinen threw 47-02. Phelps also won the discus with a throw of 155-09. Bayfield’s Jordan Lanning won four events on the day and accounted for 40 of the BHS girls 82 points. She won the 100 hurdles in 16.29 seconds and the 300 hurdles in 49.28 seconds, which was nearly 2.5 seconds ahead of second place. She also won the high jump with a mark of 5-03 and the triple jump after hitting 33-08.5. 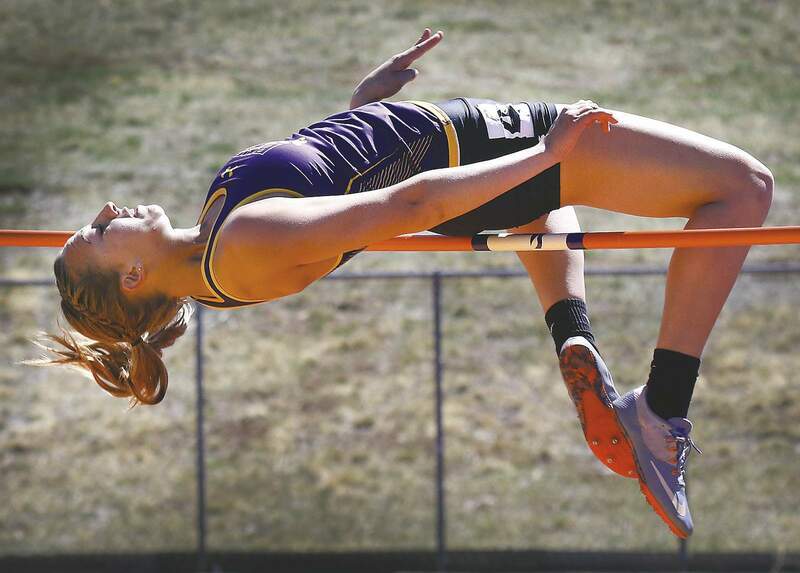 Bayfield’s Hannah Whitmer claimed the top spot in the pole vault, as she cleared 8 feet. Mikayla Barnes set a new BHS record in the shot put with a throw of 35-10.5. Both Carl Heide and Lanning said they received a boost from the comfort level of competing on their home track and having the Bayfield crowd there to support the Wolverines. Jordan Lanning of Bayfield High School goes up and over the high jump during the Pine River Invitational track meet Saturday at Bayfield High School. Lanning won the event with a height of 5-03. 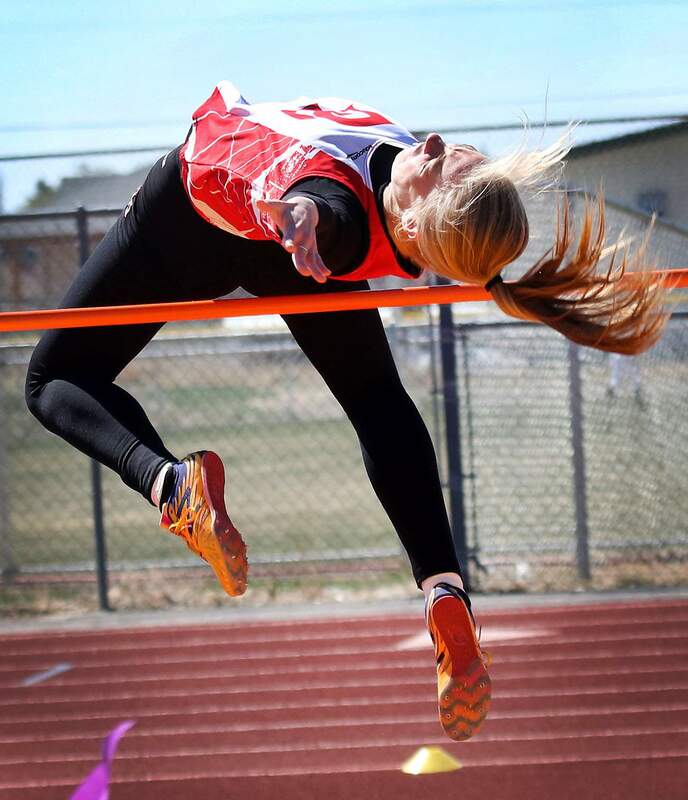 Alyssa McConnell of Durango High School goes up and over the high jump during the Pine River Invitational track meet Saturday at Bayfield High School. The DHS girls 4x800 relay team of Madeleine Burns, Emma Fitzgerald, Bekah Moenning and Abby Scott blew out the competition and finished 1:03.24 ahead of second place with a time of 9:51.96. The DHS boys 4x800 team of Noah Bodewes, Aidan Fitzgerald, Logan Moore and Luke Tichi also picked up a win in the 4x800 with a time of 8:28.45. Durango’s Alex Hise won the long jump with a leap of 22-09, as he timed his jump perfectly to avoid any aid from the wind. His jump was half an inch from tying the stadium record. Hise also won the boys 100-meter dash in 11.2 seconds. The DHS boys also had a win in the 800, with Marcus Flint finishing in 2:07.06 for first place. Ignacio took home one first-place finish, with Aliyana White winning the girls shot put with a throw of 35-11.5. 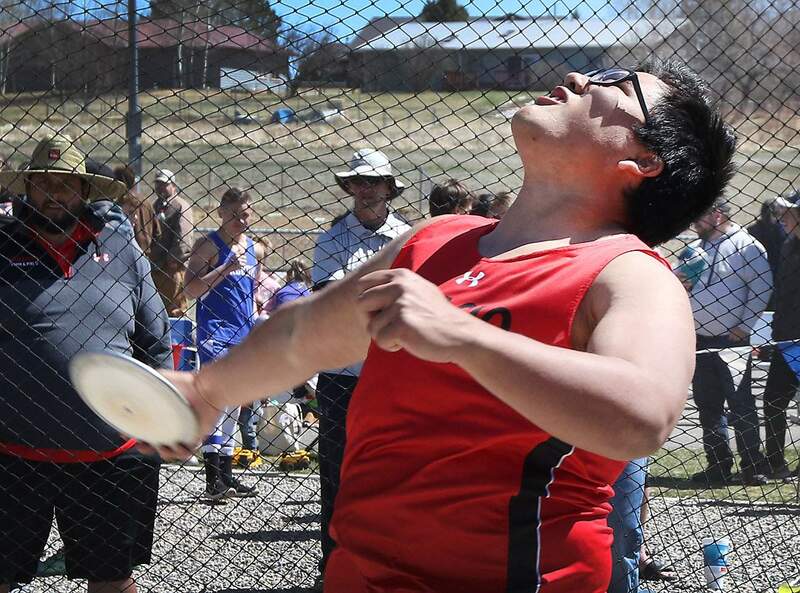 Elco Garcia was third in the 1,600-meter run, and Natoni Cundiff placed fifth in both the boys discus and shot put. Natoni Cundiff of Ignacio High School throws the discuss during the Pine River Invitational track meet Saturday at Bayfield High School. Bayfield, Durango and Ignacio will all be at the Ron Keller Invitational on Tuesday at Durango High School.